KnowCrazy.com: " BEAUTIFUL PSYCHEDELIC RIVER "
" BEAUTIFUL PSYCHEDELIC RIVER "
Rivers are commonly known to be good sources of water for irrigation. Sometimes the rivers also play as very good sites to view. They may be calm or very rough. 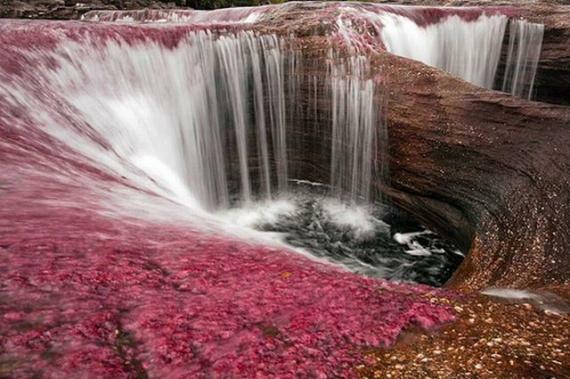 One of the rivers that play as a good tourist attraction would be the Cano Cristales. This river is found in Colombia's sierra de la Macarena. 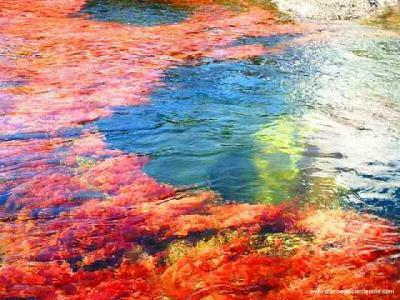 The river is known to be the most psychedelic river in the world. It is as moody as it is beautiful. In the dry season the river dries up and all one finds is a cracked up river bed. In the wet season the river will be flooded and accessing it is practically impossible. However, when you go there at the beginning of the wet season you will be able to witness a magnificent spectacle. There will be rainbow colors on the river bed. This is the reason that the river has been termed as the most beautiful river in the world. Due to this features, the river attracts many tourists who come to witness for themselves this amazing site. It's the only river in the world that will give you this amazing spectacle. The river flows through many wonderful sites too. Thus if you are a tourist coming to see the river you will also have the privilege of getting to see other sites to. The river flows from the plateau of Sierrania de la Macarena. This happens to be a park and a mountain range that is a sanctuary for many plant and animal species. The rugged terrain is coupled up with many archaeological sites and caves that have not been explored. The archaeological sites have pictograms and petroglyphs that date as far back as the pre-Colombian times. The river is the parks central feature. During the wet season the river displays a spectacular array of colors. The colors range from deep red, yellow and pink to blue black and green. These colors can be attributed to the mosses and algae that grow on the river bed during the dry season. During the wet season they get enough moisture to be able to unfold the spectacular array of colors. However, as the wet season progresses, it is not possible to view that many colors. This is because the depth of the river does not allow for the algae to get enough sunlight. For those that love rugged rivers this would be the time to view the river.